Cave Falls is a Ribbon Cascade type waterfall. 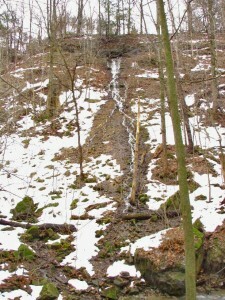 It is located on the south side of the ravine that leads to Buttermilk Falls. The interesting thing about this waterfall is that I think it is not that old of a waterfall. My reasoning is that there is very little erosion on the escarpment from the water that comes from it. If you are in the area walk the trail above it, this connects Albion Falls and Buttermilk falls. 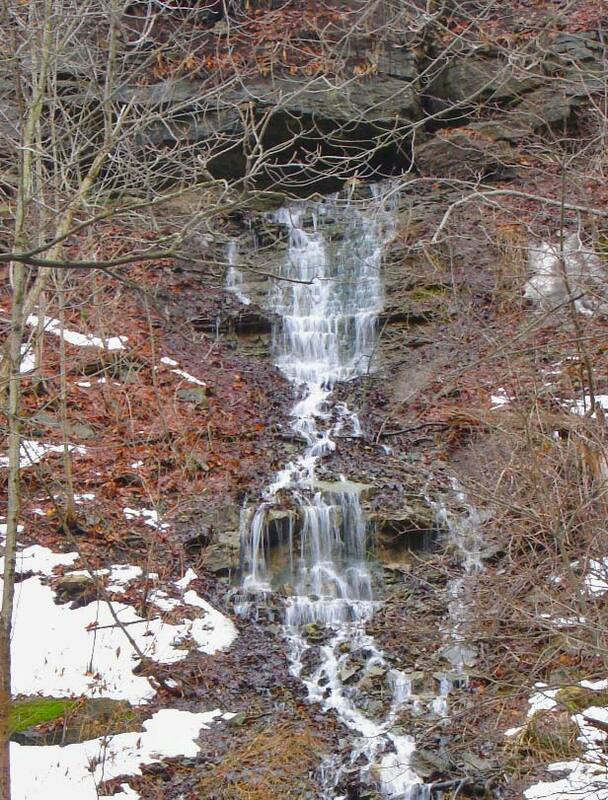 Between Cave Falls and Albion Falls you will actually come upon 4 more waterfalls 2 that don’t flow much and 2 that are ” Dormant or Ghost Waterfalls.” While hunting for the water source for Cave Falls, I noticed above this waterfall an area on the ground that had a lot of stone. 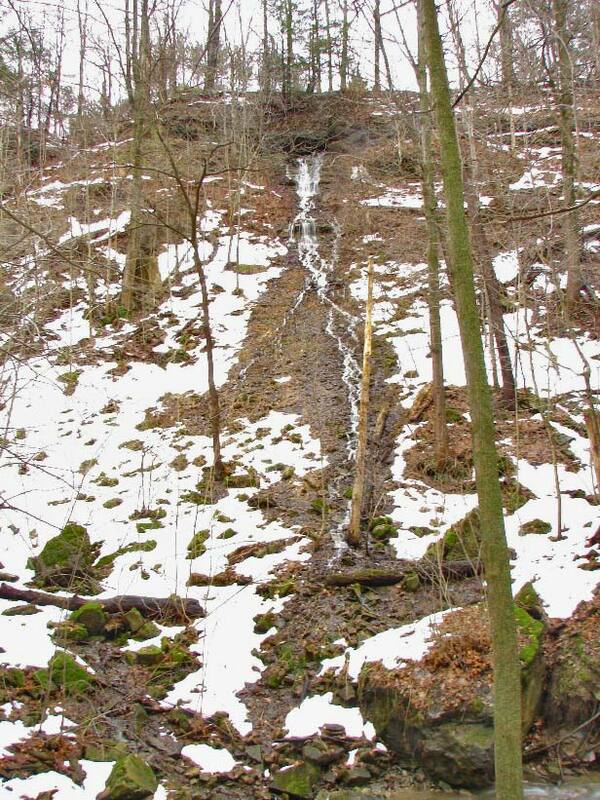 This area I think is the “inlet” point for Cave Falls, the water that comes from across the street collects in this area and sinks into the ground and then blasts out the side of the escarpment which has now formed Cave Falls. My belief is also that this water at one time fed the other waterfall just 40 feet away which is now largely dormant. One can look at the valley carved by the water and figure out at one point this was a nice little waterfall. This waterfall flows during heavy rains we will classify it at some point when we get some good hard rains, and the watershed above it gets saturated. For the waterfall chasers out there, when the conditions are right you might just be lucky enough to get the elusive very first picture of her flowing ever!!! 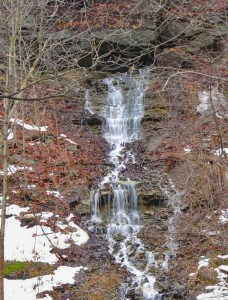 Cave Falls was discovered in 2009 by Ray Love. To reach Cave Falls from the bottom, from the Red Hill creek below Albion Falls, walk to the ravine leading to Buttermilk Falls. Cave Falls is about half way along the ravine between the junction of the Red Hill Creek (from Albion Falls) and Buttermilk Falls.